Wage Inflation – Time to Panic Yet? Increasing wages, rising rates, and looming inflation have caused a shakeup in the markets, but investors shouldn’t fret. When should investors panic about inflation and rising rates? At HiddenLevers we analyze a wide range of forward-looking economic scenarios, and many of our users have long been interested in modeling the impact of rising rates. As a result we created a Rising Rates scenario and we recently updated it to reflect a new concern on the horizon: Wage Inflation. Interest rates have been rising rapidly since late January, and many market observers have pointed to this increase as the driver of recent market volatility. But at what point do interest rates and inflation really impact stock markets? In the chart above from Hussman Funds we see higher S&P valuations clustering around lower inflation between 1% and 4%. As inflation rises, valuations are compressed. 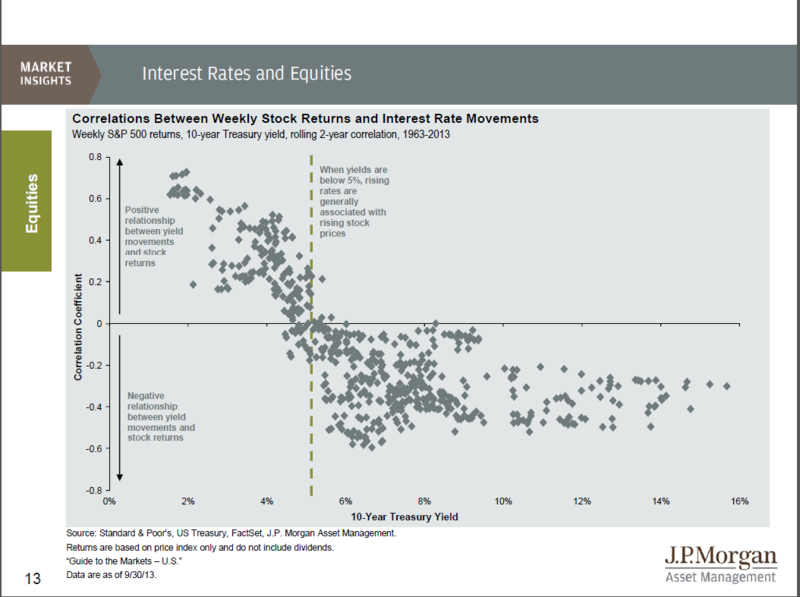 JP Morgan’s research indicates a positive correlation between 10-year treasury with rising stock markets around lower rates; this positive correlation breaks beyond 5%. Historically S&P 500 P/E ratios similar to those found today have only been observed when inflation is less than 3% as measured by CPI (over the long term we see 10-year treasury and CPI highly correlated). Meanwhile, JP Morgan has found that when rates are below 5%, rising rates tend to be positively correlated with rising stock markets. The JP Morgan research indicates that risks are further away, while Hussman’s research indicates that we are very near a red line. How are we to comport these two statements? In a normal valuation environment, the correlations shown by JP Morgan would be expected. Unfortunately, with the CAPE at 33 as of this writing, Hussman’s findings dictate that further increases in long term rates are likely to be bearish. There is one more mitigating factor – what if the current inflationary pulse is temporary? Much of the January wage inflation can be explained by minimum wage increases. In addition, year-over-year CPI was essentially unchanged at 2.14%. As much of the developed world continues to contend with disinflation, we should tread lightly in calling for big jumps in US inflation. Curious how a real rise in wage inflation might impact your clients’ investments? Try the Wage Inflation or Stagflation scenarios, just two of 90+ scenarios available on the HiddenLevers platform.